The Purple Prickly Pear Cactus is a member of the Opuntia genus. It can grow to 5 feet in height and has round to oblong purple tinged pads which give the cactus its name. 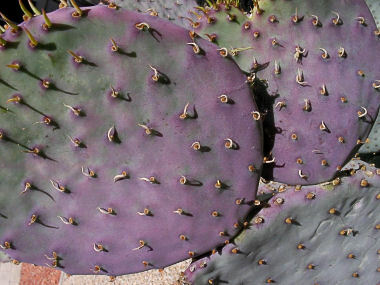 Unlike many other types of prickly pear, the purple variety has few if any spines. The cactus grows in sandy or gravelly soil at elevations below 4000 feet. The Purple Prickly Pear Cactus have a light jasmine scent which is used to attract nocturnal insects. 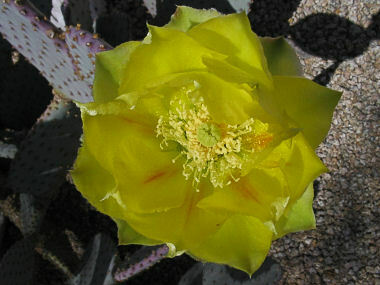 The Purple Prickly Pear Cactus blooms in the spring and produces yellow flowers to 3.5 inches in width followed by an elliptical fruit to 1.5 inches in length.